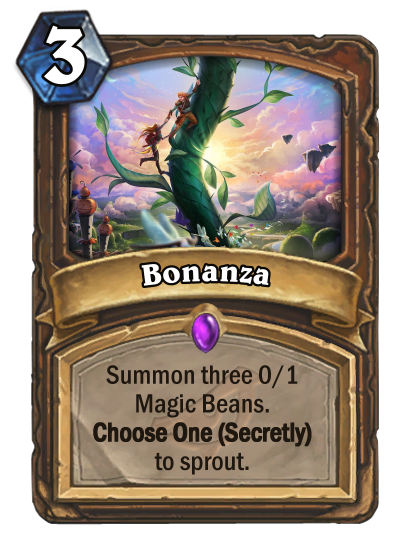 Similar to Fatespinner your opponent cannot see which Magic Bean will become the Giant Beanstalk but you can. 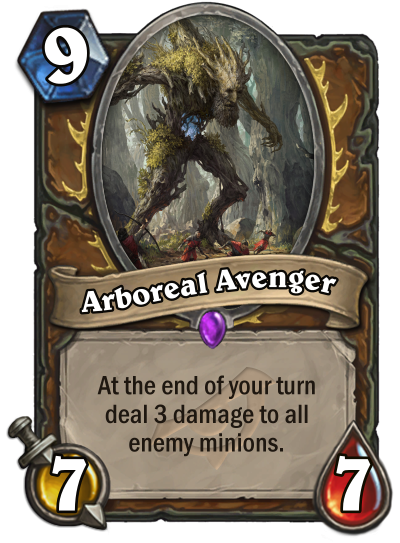 This card is meant to hearken back to Fatespinner and Druid's ability to make a secret choice. The way it's meant to work is: you create 3 0/1 Magic Beans - you choose one of them in a Discover window, left bean, middle bean, or right bean. At the start of your next turn the chosen bean becomes a Giant Beanstalk while the other 2 do nothing. 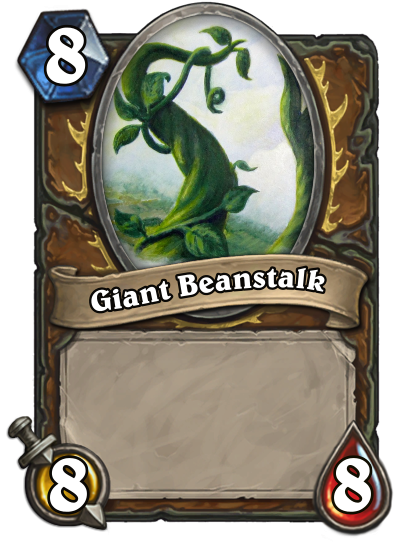 If your opponent can kill all 3 beans, no beanstalk - but if he can only kill 1 or 2 then it gets really interesting. I'm not sure how to word this effect, specifically on the Magic Bean token, and would really appreciate feedback on how to make the effect more clear. 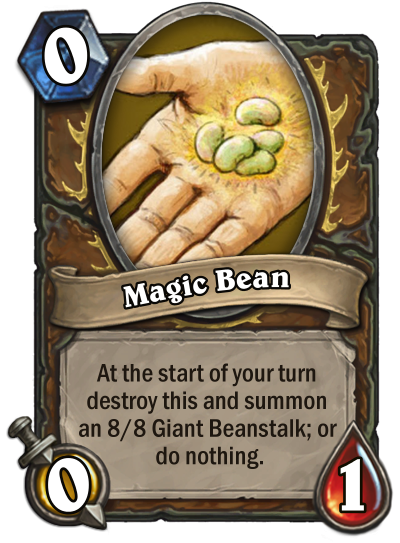 Do you think I need a 3rd token for a Magic Bean that did nothing? 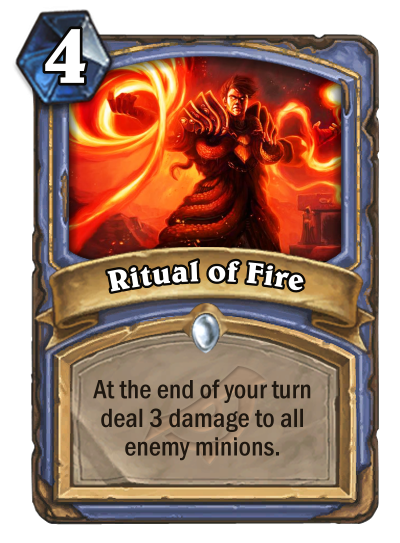 If you are worried about big Priest you can always tech in a Flight Master or Mad Summoner to mess up the res pool. 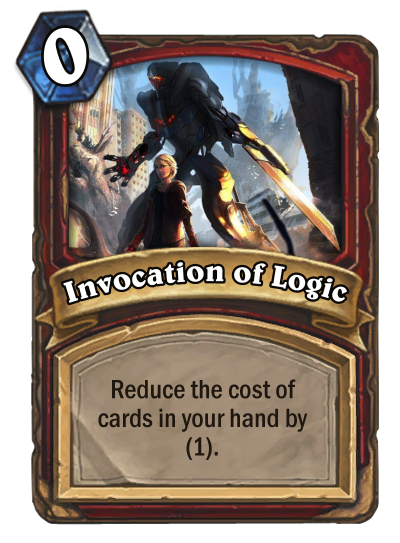 Flavor text: I could have sworn she went this way. Excuse me miss, have you by any chance seen a Rogue? Yes. 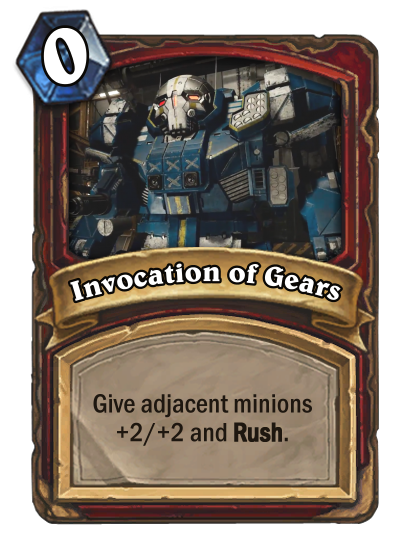 That looks like a real Hearthstone card. Edit: 'opponents' should be 'opponent's' with an apostrophe. 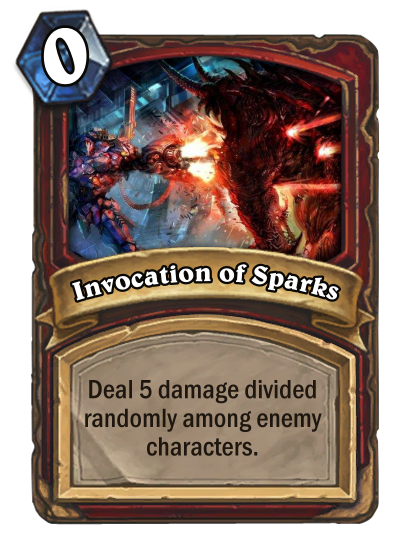 I'm assuming you want this to be a Battlecry effect. Also there's no need to capitalize Steal. Thanks for the feedback. 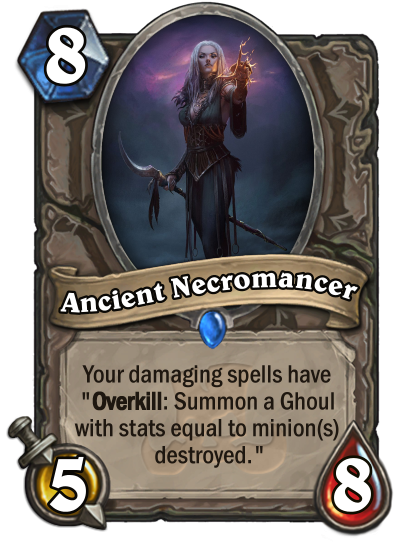 The reason the flavor seems strange is that my original idea for the card was for a spell - not a minion, but I couldn't get the effect I wanted in under 5 lines of text. The idea is that the Rogue will escape pursuit by losing herself in a crowd of innocent bystanders. I like the design of Lady Vashj but I think that the Royal Guards could be 3 or 4 cost without being overpowered. 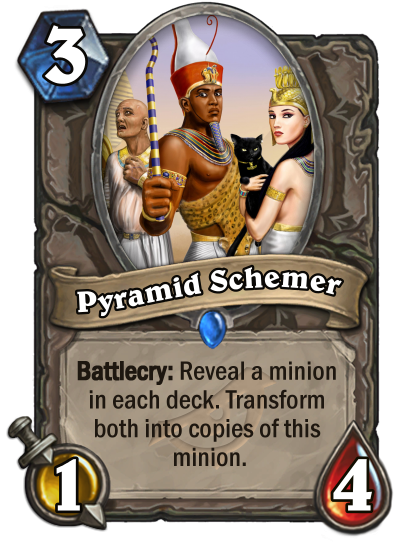 You're likely only going to draw one of them per turn, if you do manage to draw more you should be rewarded. 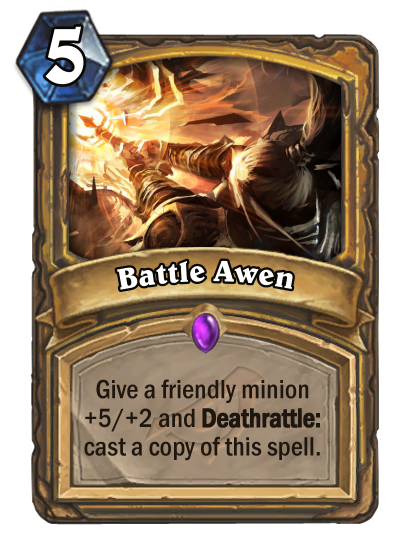 I'm not sure what kind of support Priest has for a card like that. 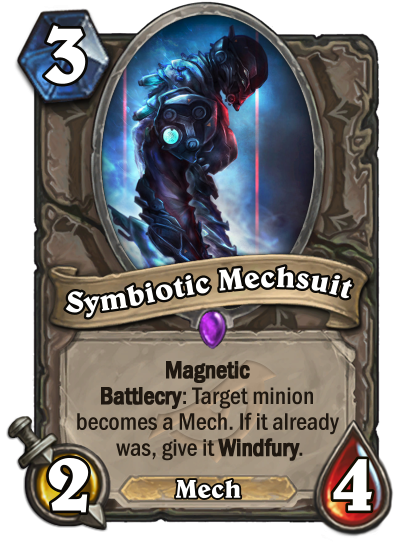 Seems ridiculously strong if they can pull it off though. Recruit 3 for 5? Gather Your Party cries in a corner. 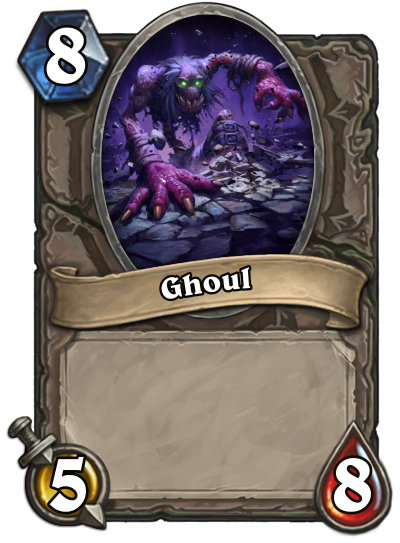 My idea is is kind of similar to yours, although Rogue has much more support for this deck type. 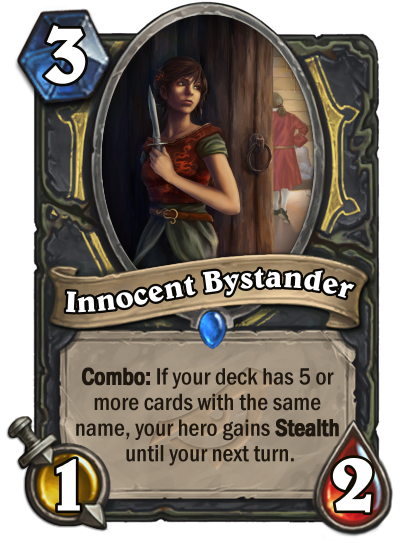 I like Stealth as a defensive mechanic for Rogue over healing / armor and with the rotation of Valeera the Hollow there might be room in the game for a card like this. 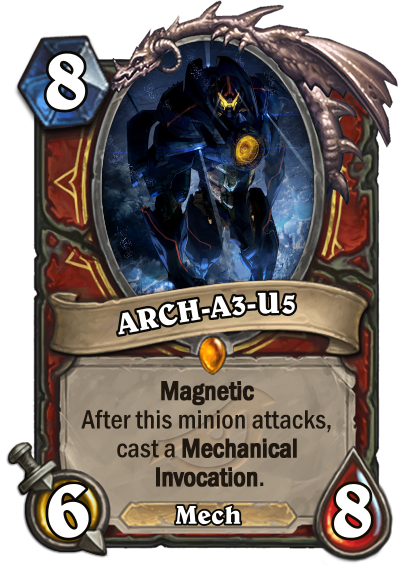 Kalimos, Primal Lord but for Mech Warrior. With a teensy bit of Flappy Bird flavor. I'm assuming that the chosen 'Stratagy' becomes the rules text on the Field Commander. Onward Now: should read 'your opponent's' rather than 'enemys'. Hired Mob: I would replace 'summon not directly from hand' with 'recruit'. It's not as good but it's a heck of a lot simpler. My first pass at this theme. 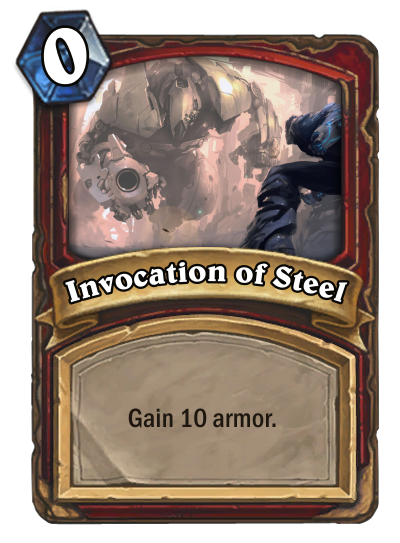 I'm not sure about the wording but I like the possibilities of the card.